As I came into the world, this duo was riding mightily high on motion picture screens all over America. Their box office was something one couldn't sneeze at. Arriving at the age of some cognition, I began hearing my Mother go on and on about how much she liked seeing all those so funny Stan Laurel and Oliver Hardy movies. However, I had yet to comprehend what movies were. Most of Stan And Ollie depicts the iconic pair of slap stickers after reaching their apex in the film biz. Descending ... compared to ascension ... makes for more poignant drama, I guess. As with just about all biopics … this one bends and stretches what actually happened to my Mom's favorite comedy team. Most movies of this genre would likely be a bit drab if some punching up weren't applied. No, this Stan And Ollie, directed by Jon S. Baird, is for reminiscing and enjoying the shtick these two lovable guys put out there for everyone's amusement. Their bits are cleverly spaced among the “real- life” events Stan Laurel and Oliver Hardy experienced as America's love affair with their on-screen antics ebbed, and then, less triumphantly, extended on the stage as they entertained audiences in Britain and Ireland. To totally savor this film, one must have some sense and/or remembrance of Laurel and Hardy. That information will make things clear to you that John C. Reilly (Hardy) and Steve Coogan (Laurel) have nailed it! If each actor had undergone plastic surgery, in addition to the excellent makeup put to them for appearing even more like the character each plays, you'd swear both had come back to life and decided to do another picture in full color … not black and white. Baird does let you in on the wishy-washy atmosphere of Hollywood. Best example of that is when Danny Huston trips onto the big screen …. or should I say (?) ...“on set,” as the famous producer Hal Roach. Danny always gets my attention. I'd go see any picture that has him in it. Try him out in the uproarious, outrageous and completely unsung film with Robin Wright, unceremoniously titled, “The Congress.” It's all about Hollywood and also stars Harvey Keitel and Jon Hamm. Oh yes, to continue this not terribly important sidebar: Mr. Huston's father had the first name of John. Danny's also the half brother of Angelica. Too bad the Roach role wasn't called for more in the Stan And Ollie script written by Jeff Pope. In “The Congress” you'll love hating Danny as another really big time studio producer. I just really laughed at Reilly and Coogan hitting their marks so well after they'd choreographed, with sweet mimicry, what so many have come to know watching the original L & H pictures released back in the first half of the 20th century. Bravo, Guys. The script brings in the wives of each film star. We get to know them somewhat and how each couple relates, respectively, to his or her spouse. Stan's wife, Ida Kitavea Laurel, is played by Nina Arianda and Shirley Henderson has the role of Ollie's spouse, Lucille Hardy. The end credits indicate the film is dedicated to her memory. 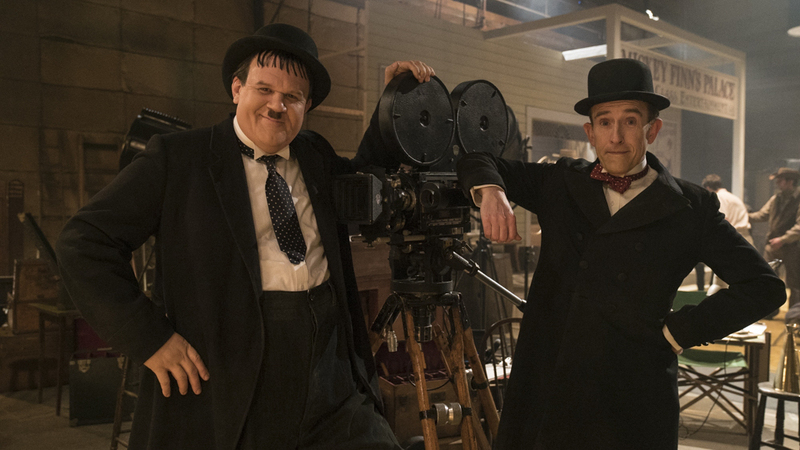 Stan and Ollie ultimately underscores the love and respect each man holds for the other. There might have been less actual conflict in their lives than shown here, but that only suggests to me that Stan Laurel and Oliver Hardy had, when you get right down to it, a pretty damn good run at fame and fortune. Seems to me it couldn't have happened to two nicer gentlemen. But what do I know? I was only a tot when these guys were on a roll ... big time. Hurray for Hollywood.